MR. ROBERT KERR has been honourably associated with Glasgow Second Circuit during the major part of a long life. One of the few remaining of the ” Stalwarts ” who saw the humble beginnings of our church on the eastern side of this great city, it is a treat to listen to his recollections of the worthies and work of the bygone days. To find him in the right mood is to be assured that the statement anent the Scotsman’s lack of humour is a libel. Their quaint meeting places and odd sayings have found their way into verse, for Mr. Kerr occasionally “drops into poetry.” But amid it all, he conveys to his hearers the sense of having been caught in the sweep of a mighty religious movement which sounded and sweetened the deeps of his life. He is not so obsessed either with the wonders of the past as to be blind to the glories of the present. The phenomenal progress of the last few years especially, has been to him and all concerned a great joy. 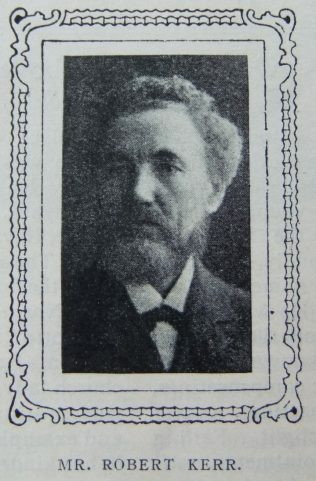 While most of his energies have been devoted to Tollcross, the “Mother” church, he has served the station as local preacher and in many other ways usefully and acceptably. Retaining an intense interest in young life, he continues to work as superintendent with undiminished ardour. Mr. Kerr is at his best, however, at a love-feast or Class meeting. With a rich spiritual experience, a wonderful gift of old-fashioned song, and deep and reverent love for the Word, his leadership is of the most effective and encouraging kind. In the house of mourning and in the sick-chamber he has also exercised a felt and helpful ministry. Primitive Methodists can ill spare men of the type of our friend, and our prayer is that he may yet see many years of service. Based on the information in the sketch, I have been unable to identify Robert in census returns. Can anyone point me in the right direction? The Parkead History website identifies that Robert was born in 1850 and his parents were handloom weavers. The Primitive Methodist Leader reports the jubilee of Robert’s membership in 1924.